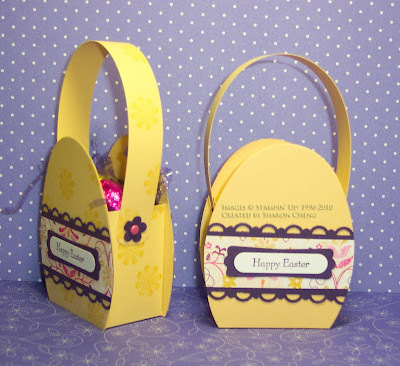 I was inspired to make these Easter Egg baskets thanks to baskets posted by Melissa Rodgers and Gayla O’Dell. When I saw the template that they used, I realized that I could use the Big Shot Oval Scallop Frame die to make the egg. That made it faster for me to make several baskets. 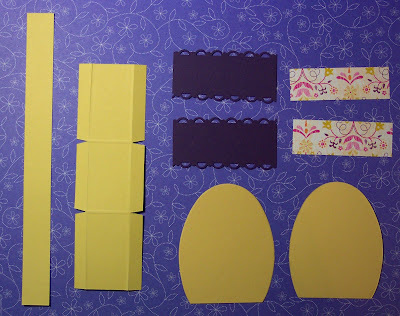 In So Saffron, I made two eggs by using the Oval Scallop Frame die to cut two oval shapes and then cutting off one end off of each oval. I also cut the following pieces. 2 ¼” from each end of the short sides. 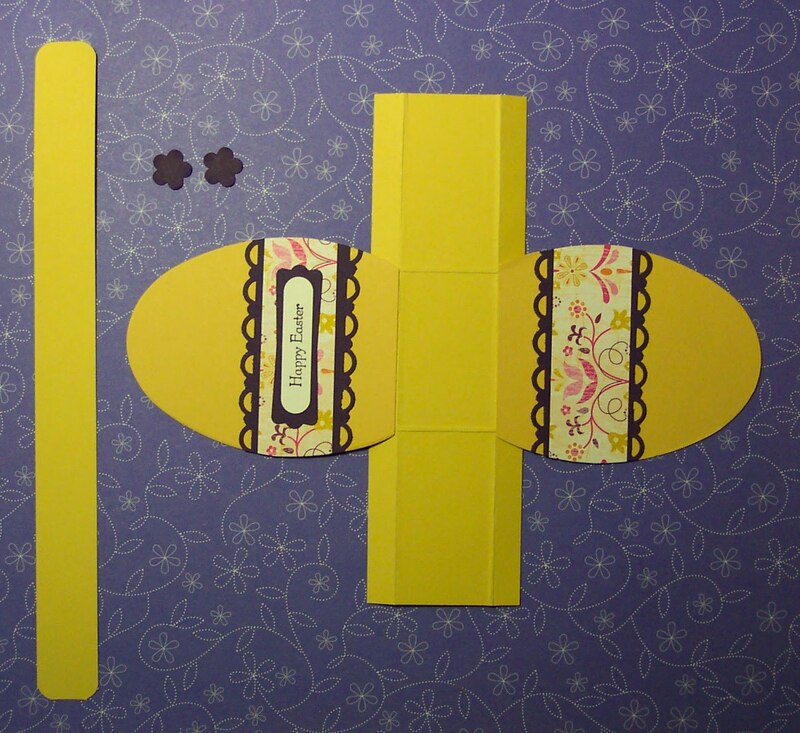 Fold along the score lines and clip out a small triangle at each of the intersections as shown. This will make it easier to fold your box. Use the scallop trim border punch to add a decorative edge along both sides of the Elegant Eggplant pieces. Use the Modern Label and Trio Flower punches to make the Elegant Eggplant embellishments as shown. When you add the Razzleberry paper, you will hide where you have punched out these embellishments. 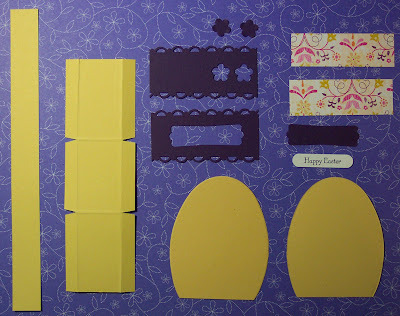 Using Elegant Eggplant classic ink, stamp Happy Easter from the Teeny Tiny Wishes stamp set on a scrap of Whisper White cardstock. Punch out using the Word Window punch. 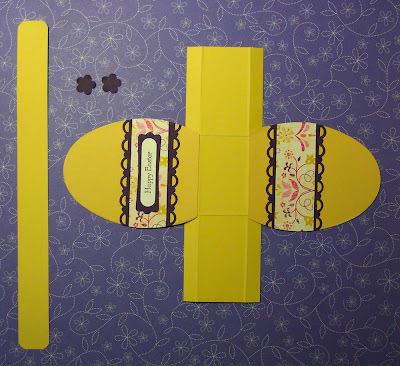 Adhere the trim as shown on the eggs and cut to fit the oval shape. Attach the eggs to the scored piece of So Saffron as shown. Assemble to form the basket. Attach handle using brads as shown on the sample. 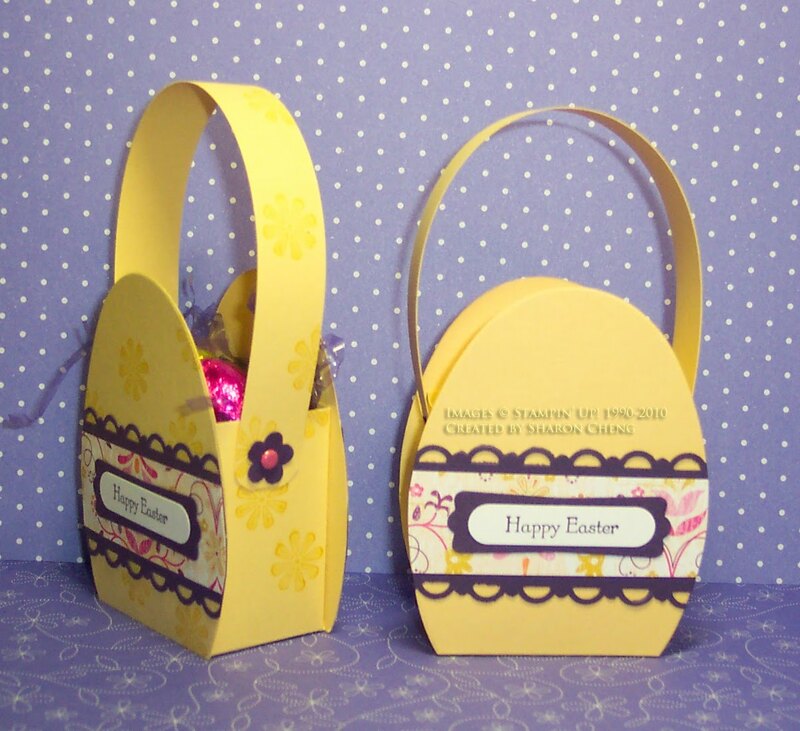 I hope you enjoy making these baskets and giving them as small gifts.